Contact your health insurance provider for prescription coverage details. If you do not have prescription coverage, call or visit manufacturer websites for patient assistance information. Check your prescription before leaving the pharmacy to verify the correct device was dispensed and check expiration dates. This comparison is for informational purposes only, contact the manufacturer for the most recent information and recalls. ​Click orange text below for links to resources (links underlined in pdf). Impax is the generic for Adrenaclick®. ​Adrenaclick® is no longer being made. ​Mylan's brand & generic devices are identical. ​Mylan does not update savings cards in a timely manner. Patients may still use expired coupons at pharmacies. 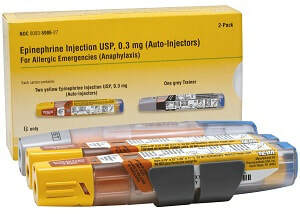 If the pharmacy will not accept it, contact Mylan's customer service. Patient Assistance Program: Not available from Teva; Teva provides a list of patient assistance programs that may be able to assist patients financially.